Arguably the Cinderella story of the U Sports national championships were the Concordia Stingers, looking to win their first national medal since 1999. Meanwhile, the University of British Columbia Thunderbirds were thirsty for a medal after being denied a shot at the Golden Path trophy Saturday afternoon when they lost 1-0 to the McGill Martlets. Concordia were blanked for the first time in three games, losing 2-0 to UBC. With the loss, they finished fourth place at the national tournament—their first visit since the 2004-2005 season. Powerplay goals turned out to be the difference in this Sunday afternoon matchup in Napanee, Ontario. The Stingers took nine penalties while the Thunderbirds took eight. However, their west coast opponents scored twice with the extra player. Both teams exchanged penalties inside the first five minutes of the game, but neither of them took advantage of their opportunities. They picked up the pace in the second half of the first period, with several scoring chances coming both ways. However, the Stingers took three consecutive penalties towards the end of the period, which proved costly. Rookie defender Brigitte Laganiere, who took the first penalty of the game, was sent off for slashing. The Maroon and Gold were already in the process of killing forward Audrey Belzile’s tripping penalty, giving the Thunderbirds a five-on-three opportunity. This time, UBC made no mistake. Cassandra Vilgrain beat goaltender Katherine Purchase to give her team a 1-0 lead. Two of Concordia’s best opportunities in the rest of the game came in the third period. As the Stingers dominated in UBC’s zone, Marie-Pascale Bernier had an empty net in front of her but she hit the post. Later, Belzile deflected a shot from the point. Once again, Boughn got lucky as the puck hit the post. With less than three minutes left in the game, Stingers defender Marie-Joelle Allard took an interference penalty. On their ninth power play opportunity of the game, Logan Boyd sealed the game for UBC. The Stingers pulled Purchase for an extra forward in the final minute, but the Thunderbirds pinned the Stingers to the boards in Concordia’s zone to win the game and earn the bronze medal. Purchase made 20 saves, while her counterpart stopped all 21 shots. The shot totals were low; both teams reached the goalies less than 10 times each period. However, UBC and Concordia blocked several shots throughout the game. Belzile earned the player of the game for the Stingers, while defender Kelly Murray received the same honor for UBC. 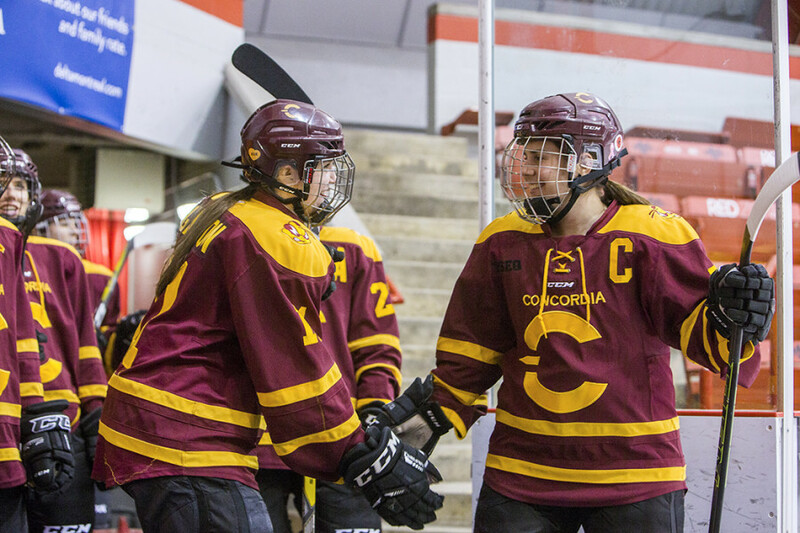 The loss and fourth-place finish marks the end of Concordia’s impressive hockey season. After losing their first seven games of the season, the Stingers turned things around in the second-half, winning seven of their last ten regular season games. UBC experienced one of their best regular seasons as they set new records for wins with 23 in 24 games. They also posted a 15-game win streak record. This was the first time the Thunderbirds were ranked first at the national championship.